Saturday, March 17, 2018 • 1–3 p.m.
Asteroids frequently pass close to or impact the Earth, very occasionally with devastating consequences for life. The last few decades of space exploration and scientific research have turned our understanding of asteroids completely inside out, showing them to be fascinating small worlds that change over their lifetimes, repeatedly dividing into pieces that can escape, form stable binary systems or come back together again. 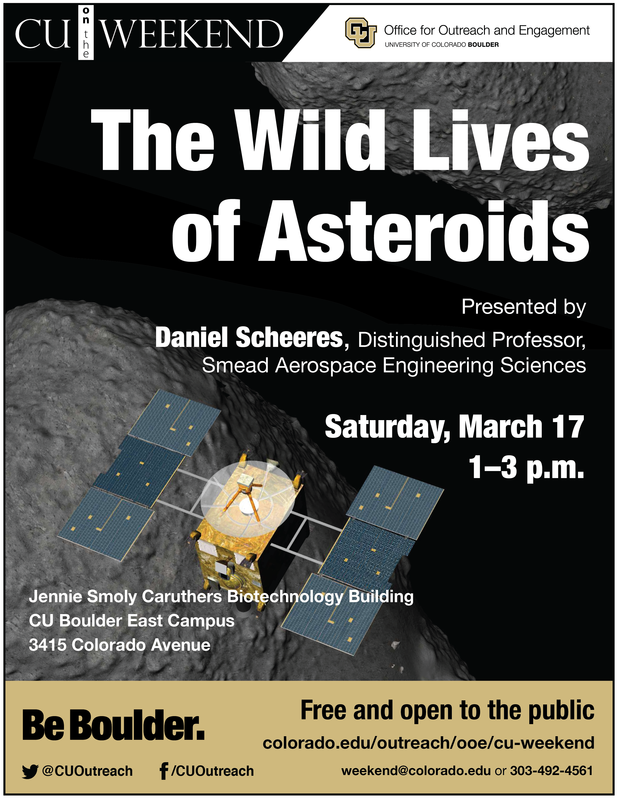 In this lecture, Scheeres will focus on recent discoveries about asteroids, describing what asteroids are like and current exploration plans for these bodies. Daniel J. Scheeres is a University of Colorado Distinguished Professor and holds the A. Richard Seebass Endowed Chair in the Ann and H.J. Smead Department of Aerospace Engineering Sciences. Prior to this he held faculty positions at the University of Michigan and at NASA’s Jet Propulsion Laboratory. He received his bachelor's degree from Calvin College and his master's and doctoral degrees from the University of Michigan. Scheeres is a member of the National Academy of Engineering, a Fellow of the American Institute of Aeronautics and Astronautics and of the American Astronautical Society. Asteroid 8887 is named “Scheeres” to recognize his contributions to the scientific understanding of the dynamical environment about asteroids. To find out more, visit Scheeres' website.